This quiz is not too uplifting. These are the opening lyrics to which musical, which premiered in 1980. The 1978 film Gray Lady Down is about the rescue of a sunken American submarine. Starring Charlton Heston, it is likely best known today because this late actor made his film debut in that film (his second role, later that same year, remains his best known role). This man appeared opposite Morgan Freeman in Freeman's first Oscar-nominated role in 1987's Street Smart, and is also known for appearances in Somewhere in Time and The Remains of the Day. Identify this Juilliard trained actor. The first episode of series 1 of Downton Abbey takes place the day after which historic event? Name the facility which opened in 1875, and is open many days in the year, though it draws its biggest television and live audience on the first Saturday in May. The characters of this 1972 novel revere a trickster folk hero named El-ahrairah, and a deity named Lord Frith. Lapine is a fictional language introduced in this novel. Name this novel which includes the characters Hazel, Silver, and Bigwig. In alpine skiing, the combined event consists of three runs held over two days. One day sees a single downhill run. The other day sees two runs in which alpine discipline which requires the tips of the skis and feet to pass between pairs of poles alternately colored red and blue? After opening with the discovery of a wreck during the opening titles, the second scene of this sequel sees the police chief arrive late to an event where a school band is playing Petula Clark's hit, Downtown. The Chekov's gun moment in this film occurs when a deputy and sailor accidentally discover a power cable while searching for a missing person; that power cable later is used to electrocute the film's antagonist. Identify this 1978 film which has one of the most famous taglines in film history; a tagline often erroneously attributed to the original film. Joe Frazier was fighting which boxer in 1973, when, after a first round knockdown, Howard Cosell famously screamed Down goes Frazier! Down goes Frazier! Down goes Frazier!? This substance is described by wikipedia as a dark brown food paste made from leftover brewers' yeast extract with various vegetable and spice additives. Identify this substance which was virtually unknown in the United States until it was mentioned in the lyrics of a Men at Work song which fits the description of this quiz. This 2004 film was nominated for the Best Foreign Language Film Oscar, losing to Spain's The Sea Inside. Identify this film which includes a famous monologue delivered by actor Bruno Ganz which is not about breaking a TV set with a Wii remote, not about the Red Wedding in Game of Thrones, not about hatred for the Cubs, or hundreds of other topics, but does begin with the line (in English): That was an order! Down Syndrome occurs when an extra copy of which chromosome is present in the cells of affected individuals? On December 7, 1941 Japanese bombers were primarily targeting the battleships at Pearl Harbor. As the linked image shows, the destroyers USS Downes and USS Cassin were both destroyed, but the battleship they shared Drydock #1 with somehow managed to come out of the battle relatively undamaged despite being a much bigger target. 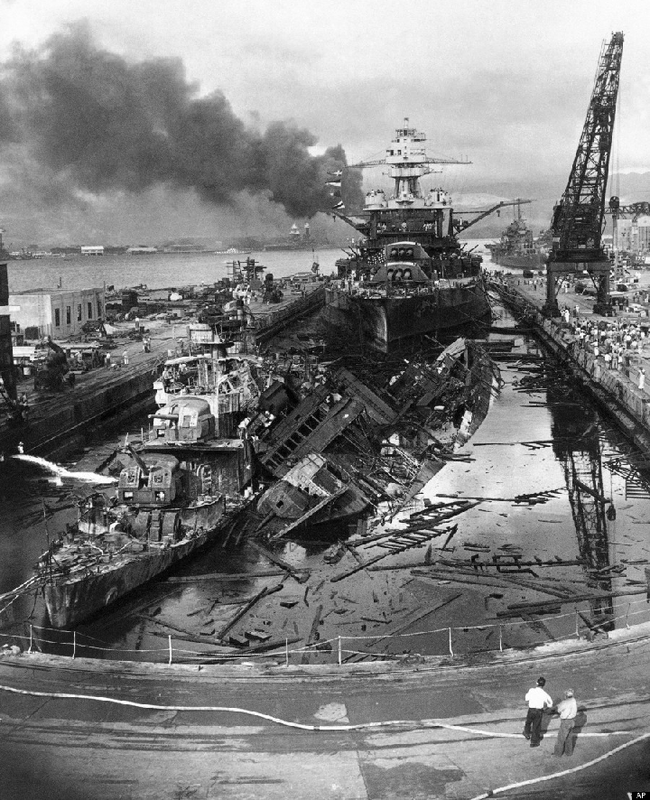 Identify this battleship named for an eastern state, the only battleship that was in dry dock at Pearl on that day, and which was later sunk after being a target ship as a part of the Operation Crossroads nuclear tests.